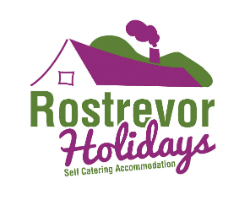 Roosley cottage is a bright 2-storey self-catering cottage, located on the premises of Rostrevor Holidays, in Rostrevor, County Down. The sun shines in through the living room sliding doors in the morning, and the view from the upstairs bedroom is across to the Mourne Mountains. This light and clean cottage with 2 bedrooms can sleep 4/5 people. The upstairs bedroom has a double and a single bed, whilst the downstairs bedroom has the option of being a twin or a single room. There is a downstairs WC, and a shower room upstairs. The combined kitchen/dining/living area has sliding doors that open on to the patio if you wish to take your breakfast outside. If Roosley Cottage is booked for the dates you require it, we can provide 2 bedroom accommodation on-site in other cottages. Please contact for further details. Sleeps 4/5 in 2 bedrooms. Upstairs Bedroom – Family bedroom, 1 double and 1 single bed. Bathroom is across the hallway, with a separate walk-in shower, in the bathroom. Downstairs bedroom is a single room, that can be made into a double on request, with a WC beside bedroom. Kitchen/living area, with freeview TV. Beds are made up, and towels are provided. Kitchen has 4-hob ceramic cooker and oven. Freeview TV. You can find further information on our F.A.Q page. We have full-size wooden cots available for use. Parking near to the cottage and in the general car-park.